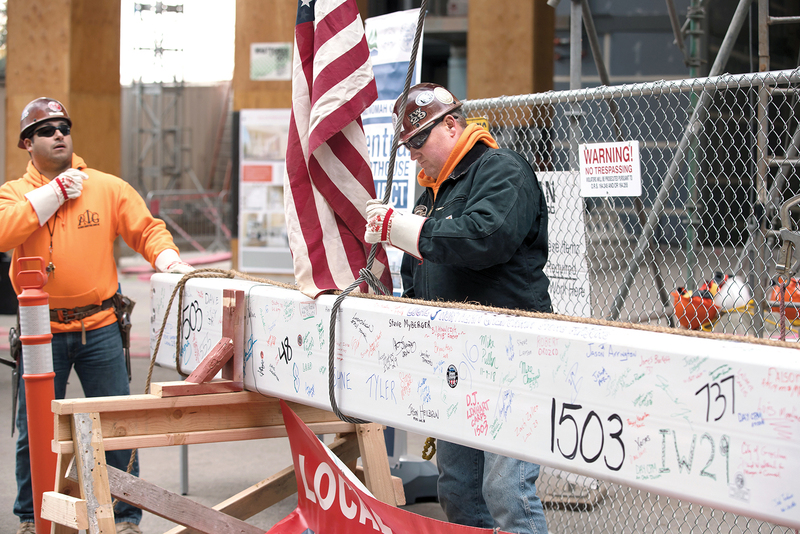 Workers secure the final structural beam that topped off the new MULTNOMAH COUNTY Courthouse under construction. The beam bore messages and signatures of county employees. The 325-foot building is scheduled to open in spring 2020 and will include 44 courtrooms and space for free child-care services for low-income families with court business. The current courthouse is being sold and The Oregonian reports it is likely to be redeveloped as a hotel or office building. ● ALAMEDA COUNTY is considering giving a boost to restaurant entrepreneurs with new regulations for pop-up eateries that are expected to be rolled out next month, the East Bay Express reported. “The pop-up restaurant scene here in Alameda County is important and evolving faster than existing food safety laws,” Wilma Chan, president of the Alameda County Board of Supervisors, told the newspaper. The director of the county’s environmental health department proposed new regulations at a recent meeting. Under the proposal, pop-ups may be hosted only in permitted food facilities, known as host facilities. Host facilities would be required to notify the Health Department of all proposed pop-up operations and submit an application, including dates and times of operation, a proposed menu and a to-be-determined fee. Pop-ups must also have a person in charge from the host facility, and there must be at least one person with a food safety certification on staff. Only an ABC license holder may serve alcohol. ● Due to high rents and a 3 percent vacancy rate, SAN DIEGO COUNTY is offering residents up to $500 to rent to veterans and others experiencing homelessness, the San Diego Union Tribune reported. The new incentive program is being offered through the county’s health and human services agency housing and community development services department. The department is offering up to $500 in bonuses, damage reimbursements up to $5,000 and assistance with security and utility deposits. “Some landlords have concerns about the person being able to pay the rent and the security deposit, and about damage to their property once the tenant leaves,” Rorick Luepton, landlord liaison at the Housing and Community Development Services, said in a news release from the county. BROWARD COUNTY’s Office of Economic and Small Business Development recently graduated its fourth group of entrepreneurs from a program it calls FasTrac NewVenture. It’s designed to help entrepreneurs evaluate business ideas and create start-up plans, the South Florida Times reported. The free program attracted 15 entrepreneurs; the top three entrepreneurs, judged for their business plans and oral presentations, were offered seed money grants to help fund their start-up costs. DUBOIS COUNTY senior citizens will have new fitness options come the new year, The Herald reported. The Dubois Branch Library will offer twice-a-week classes as part of a national 12-week study by a video workout company to test libraries’ ability to bring services to senior citizens. The library received the exercise DVDs free of charge and will be able to use them indefinitely after the study ends. Participants must be 65 or older and bring their own weights and stretch bands. The exercise routine also works for those who must remain seated, who are confined to a wheelchair or use a walker. ● BALTIMORE COUNTY is hoping to combat infant mortality with the launch of a new program called Babies Born Healthy. The program will deploy community health workers and nurses to reach out to high-risk pregnant women to connect them with services to help them stay healthy, The Baltimore Sun reported. The county is receiving funding of $200,000 from the state each year for the next three years. The infant mortality rate was 6.5 per 1,000 births last year, which was an increase over the previous year. The Centers for Disease Control and Prevention report that the national average is less than 6 percent. ● The WASHINGTON COUNTY Health Department is offering a series of “Tobacco Free for Life” programs, funded by the Cigarette Restitution Fund, to help people stop smoking. In addition to the one-hour classes, which recently began and continue through Feb. 14, 2019, support groups are offered in between classes. Language interpretation assistance is also available at no cost. The state General Assembly started the fund with money derived from the 1998 Master Tobacco Settlement from the tobacco industry. MACOMB COUNTY will deliver “shelf-stable” meals Dec. 1 in anticipation of unsafe weather or other emergency circumstances that could prevent the delivery of hot meals for the homebound, WXYZ-TV reported. The county is asking for help packing and delivering food boxes from its county warehouse. The special delivery will require 130 volunteers to deliver the meals. The move is similar to Meals on Wheels Tampa, which delivered 4,300 shelf stable meal packs and gallons of water to 850 senior and homebound recipients in May, ahead of hurricane season. A voter mandate has given LINCOLN COUNTY officials 45 days to redraw commissioner districts and add two members to the County Board. The current commissioners will draw a map of five districts from the current three. Then, a committee composed of the county clerk, county attorney and country treasurer will appoint two new commissioners, the North Platte Telegraph reported. Voters approved the measure to expand the board 12 years after a similar measure failed. Voters in LYON COUNTY shot down an advisory question rescinding its ordinance allowing brothels. More than 16,000 voters opposed the ordinance and slightly more than 4,000 voters favored it. The BURLINGTON COUNTY Prosecutor’s Office will supply 75 hotels and motels with naloxone kits in hopes of fending off opioid overdoses. The sheriff’s office will increase patrols of those properties, The Press of Atlantic City reported. Operation Safe Overnight aims to save lives and increase enforcement activity. The Prosecutor’s Office Gang, Gun and Narcotics Task Force has also prioritized hotels and motels as a focus of its investigative and enforcement activities in 2018, where at least 15 people have died of overdoses in 2018. The sheriff’s office held a three-hour training for hotel workers on the opioid crisis, a naloxone demonstration and a panel discussion with law enforcement. ● NASSAU COUNTY will send notices estimating the tax impact of the county’s new reassessment to all property owners. The County Legislature demanded the tax-impact statements after learning that Nassau’s recently mailed disclosure notices about the reassessment did not show how the changes would affect property owners’ tax bills, Newsday reported. ● SUFFOLK COUNTY is working with Paws of War to operate a mobile veterinary clinic that will be solely dedicated to serving veterans and first responders, their companion animals, emotional support animals and service dogs. County Executive Steve Bellone said the clinic was the first of its kind. The “Vets to Vets” veterinary service will be free of charge to veterans and first responders living in Suffolk County, and soon all of Long Island. Services provided will include spay and neutering, physical exams, vaccines, dental work, micro chipping, testing, nail trimming and much more. The group will use the launch to advocate for service animal wellness, and preventive medicine and exams. Holiday closures of the FRANKLIN COUNTY animal shelter have prompted a new program, “Holiday Sleepover,” which allows families to take dogs home for three days over Thanksgiving, Christmas and New Year’s Day. Families wanting to participate will be asked to take pictures of the dog in their care and write up a paragraph about the experience, which will be used to help find a permanent home for the dog. In addition to having extra attention over the holidays, the dogs will also get a chance to try out living in homes. Voters in LANE COUNTY were able to vote one of two ways on a particular ballot question, and in doing so they chose to keep that format for subsequent elections. They defeated a proposal to adopt the STAR system (Score, Then Automatic Runoff), which would have let voters give each candidate a score, ranging from zero to five. The two candidates with the highest cumulative scores would have then gone to an instant runoff, Oregon Public Broadcasting reported. WESTMORELAND COUNTY is dropping residency requirements for applicants to department of public safety, children’s bureau, area on aging and county prison. County employees typically have to live in the county within 180 days of hire, but the dearth of applications for 35 different positions necessitated the move. The Tribune-Review reported that qualified candidates who live in Westmoreland County will be given preference over applicants from outside of the county. Voters in five counties approved the Sunday sale of alcohol in different venues. Retailers in GREENWOOD and MCCORMICK counties can now sell beer and wine, FLORENCE COUNTY restaurants and bars can sell alcohol, retailers in DARLINGTON COUNTY can sell beer and wine and in ANDERSON COUNTY, stores can sell beer and wine and restaurants can sell anything, The State reported. Large trucks have been causing trouble on small roads, so ALBEMARLE COUNTY Supervisors have passed a resolution banning tractor-trailers from two county roads. “(They create) a problem for everybody who lives in the area and the people who are traveling through because they can’t make the turn if a tractor-trailer is blocking the intersection,” Supervisor Liz Palmer said. The Board’s resolution will next go to the Commonwealth Transportation Board, according to WVIR-29 News. Westmoreland Coal has paid LINCOLN COUNTY a nearly $5 million tax bill that was in jeopardy following the company’s bankruptcy filing. The payment satisfied both mineral severance and ad valorem taxes. Several Texas counties objected to the company’s bankruptcy plan, but dropped those objections after reaching a payment agreement with Westmoreland, the Kemmerer Gazette reported. News From Across the Nation is compiled by Charlie Ban and Mary Ann Barton. If you have news to share, email: cban@naco.org or mbarton@naco.org.